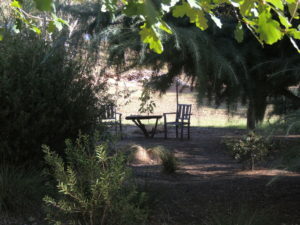 An April visit to a nearby garden in Rylstone revealed a number of charming views with the afternoon sun glancing through the trees and settling on various sitting areas. I would have been delighted to sink down upon one of these chairs and enjoy the peace on another day, but the garden was full of visitors and I joined them in admiring the work of the owners. At the front of the house was a shrubbery of natives full of tiny yellow-rumped thornbills, which had made this safe area their home. 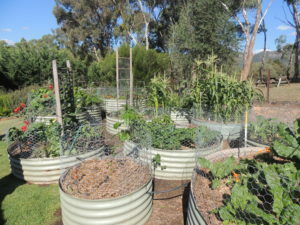 A cleverly designed vegetable garden area displayed a variety of greens growing contentedly alongside a stunning Sturt’s Desert Pea that was much admired by everyone. 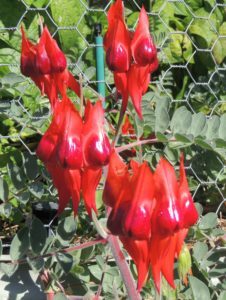 Gotta love a Sturt’s Desert Pea. I’ve only seen one in the Royal Botanic Gardens here in Melbourne. Yes, stunning flowers. These ones didn’t have the black centre which looks even more dramatic.